Set in the charming Piedmont countryside, Relais I Castagnoni is a B&B guesthouse in the heart of Rosignano. 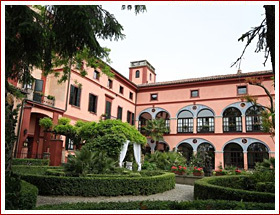 Originally a convent, now I Castagnoni is the summer residence of a family who has been living there for generations. The old convent has been renovated, with elegantly designed bedrooms, a kitchenette and a breakfast room. All the rooms of the property lead to outdoor gardens where Continental lunches are served in the mornings. The staffs speak Italian, French and English. All five rooms are fitted with antique furniture, bathroom and shower, hairdryer, minibar, telephone, satellite TV, and pay-per-view channels. Wi-Fi is available throughout the property and is free of charge. On the weekends and on request, guests are treated to meals cooked by the family. There is also a charming shop that sells local products and gifts. Guests have access to an outdoor pool, free sauna, Turkish bath and wellness centre. Visitors can tour the area and can take part in the local grape harvest or dine on delicious traditional regional dishes. Other activities include tennis, horse riding and cycling. I Castagnoni Relais offers free parking, with no reservation required. I Castagnoni is situated in the Po Valley and about 20 minutes drive from the town of Casale Monferrato.